هوشمند, حسین, آهنگرزاده, مینا, سیدمرتضایی, ُسیدرضا, صیفی آبادشاپوری, مسعودرضا, داغری, مریم, سلیمانی, جمال. (1397). بررسی اثر محافظت کنندگی پروتئین های نوترکیب VP28 و VP19 یک جدایه ویروس لکه سفید به روش خوراکی در برابر ویروس بیماری لکه سفید در میگوی سفید غربی. فصلنامه محیط زیست جانوری, 10(1), 361-368. حسین هوشمند; مینا آهنگرزاده; ُسیدرضا سیدمرتضایی; مسعودرضا صیفی آبادشاپوری; مریم داغری; جمال سلیمانی. "بررسی اثر محافظت کنندگی پروتئین های نوترکیب VP28 و VP19 یک جدایه ویروس لکه سفید به روش خوراکی در برابر ویروس بیماری لکه سفید در میگوی سفید غربی". 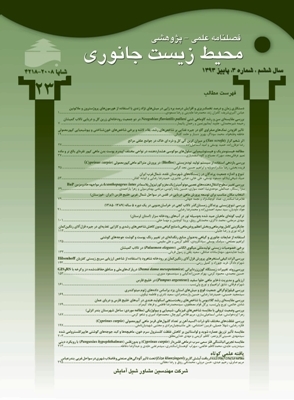 فصلنامه محیط زیست جانوری, 10, 1, 1397, 361-368. هوشمند, حسین, آهنگرزاده, مینا, سیدمرتضایی, ُسیدرضا, صیفی آبادشاپوری, مسعودرضا, داغری, مریم, سلیمانی, جمال. (1397). 'بررسی اثر محافظت کنندگی پروتئین های نوترکیب VP28 و VP19 یک جدایه ویروس لکه سفید به روش خوراکی در برابر ویروس بیماری لکه سفید در میگوی سفید غربی', فصلنامه محیط زیست جانوری, 10(1), pp. 361-368. هوشمند, حسین, آهنگرزاده, مینا, سیدمرتضایی, ُسیدرضا, صیفی آبادشاپوری, مسعودرضا, داغری, مریم, سلیمانی, جمال. بررسی اثر محافظت کنندگی پروتئین های نوترکیب VP28 و VP19 یک جدایه ویروس لکه سفید به روش خوراکی در برابر ویروس بیماری لکه سفید در میگوی سفید غربی. فصلنامه محیط زیست جانوری, 1397; 10(1): 361-368. ویروس بیماری لکه سفید یکی از آسیب ­رسان­ ترین ویروس‌ها در پرورش میگوی جهان و ایران است. پروتئین­ های سطحی این ویروس در مراحل اولیه برخورد با سلول­ های میزبان نقش بسیار مهمی دارند و کاندیدی برای ساخت واکسن­ هایزیر واحد یا نوترکیب محسوب می ­شوند. این مطالعه به­ منظور دستیابی به این پروتئین ­ها جهت انجام ایمن­ سازی میگو وانامی طراحی گردید. ژنوم ویروس لکه سفید از میگوهای بیمار و دارای علائم بالینی مزارع پرورش میگوی چوئبده آبادان استخراج گردید. پس از تکثیر و خالص ­سازی، ژن پروتئین‌هایVP28 وVP19در باکتری TG1 کلون شدند. بیان پروتئین بررسی و پلیت ­های تجاری توسط باکتری حاوی پروتئین نوترکیب غیرفعالشده پوشانده شد. پست لاروهای مرحله 30 میگوی سفید غربی با پلت­ های نوترکیب تغذیه شده و در روزهای 9 و 23 پس از تغذیه، با ویروس لکه سفید چالش شدند. نتایج آزمایش مواجهه اول نشان داد که کم­ترین درصد تلفات در گروه­ های مختلف مربوط به گروه VP28 برابر 3/84±30% و بالاترین درصد مربوط به گروه TG1 برابر 2/93±72/22% بود. در آزمایش مواجهه دوم کم ­ترین درصد تلفات مربوط به گروهVP28 5/09±%50و بالاترین درصد مربوط به گروه TG1 2/22±75/55% بود. با توجه به نتایج تحقیق پروتئین نوترکیب VP28 قابلیت ایجاد محافظت را در برابر ویروس لکه سفید دارد درحالی­ که پروتئین نوترکیب VP19 قابلیت محافظت را نخواهد داشت. هم ­چنین میزان بازماندگی ارتباط مستقیم با مدت زمان در اختیار داشتن پروتئین نوترکیب دارد. Alabi, A.O. ; Jones, D.A. and Latchford, J.W., 1999. The efficacy of immersion as opposed to oral vaccination of Penaeus indicus larvae against Vibrio harveyi. Aquaculture. Vol. 178, pp: 1-11. Ausubel, F.M. ; Brent, R.; Kingstone, R.E. ; Moore, D.D. ; Seidman, J.G. ; Smith, J.A. and Struhl, K., 1992. Short Protocols in Molecular Biology.2nd edition, John Wiley and sons. New York. pp: A1-15. Bright Singh, I.S. ; Manjusha, M.; Pai, S.S. and Philip, R., 2005. Fenneropenaeus indicus is protected from white spot disease by oral administration of inactivated white spot syndrome virus. Diseases of Aquatic Organisms. Vol. 66, pp: 265-270. Caipang, C.M.A. ; Verjan, N.; Ooi, E.L.; Kondo, H.; Hirono, I.; Aoki, T.; Kiyono, H. and Yuki, Y., 2008. Enhanced survival of shrimp, Penaeus (Marsupenaeus) japonicus from white spot syndrome disease after oral administration of recombinant VP28 expressed in Brevibacillus brevis. Fish and Shellfish Immunology. Vol. 25, pp: 315-320. Chen, L.L. ; Leu, J.H. ; Huang, C.J. ; Chou, C.M. ; Chen, S.M. ; Wang, C.H. ; Lo, C.F. and Kou, G.H., 2002a. Identiﬁcation of a nucleocapsid protein (VP35) gene of shrimp white spot syndrome virus and characterization of the motif important for targeting VP35 to the nuclei of transfected insect cells. Virology. Vol. 293, pp: 44-53. Chen, L.L. ; Wang, H.C.; Huang, C.J. ; Peng, S.E. ; Chen, Y.G. ; Lin, S.J. ; Chen, W.Y. ; Dai, C.F. ; Yu, H.T. and Wang, C.H., 2002b. Transcriptional analysis of the DNA polymerase gene of shrimp white spot syndrome virus. Virology. Vol. 301, pp: 136-147. Citarasu, T.; Sivaram, V.; Immanuel, G.; Rout, N. and Murugan, V., 2006. Influence of selected Indian immunestimulant herbs against white spot syndrome virus (WSSV) infection in black tiger shrimp, Penaeus monodon with reference to haematological, biochemical and immunological changes. Fish and Shellfish Immunology. Vol. 21, pp: 372-384. Dehghan, M.; Jafariyan, H.; HabibiRezai, M.; Amoozagar, M.A. and Sahandi, J., 2011. Potential of Brine Shrimp (Artemia urmiana) Enrichment with Two Species of Bacillus and Yeast (Saccharomyces cerevisiae). World J of Fish and Marine Sciences. Vol. 3, No. 6, pp: 523-528. Devaraja, T.N. ; Otta, S.K. ; Shubha, G.; Karunasagar, I.; Tauro, P. and Karunasagar, I., 1998. Immunostimulation of shrimp through oral administration of Vibrio bacterin and yeast glucan in: Advances in shrimp biotechnology. Flegel, T. W., (Ed), National centre for genetic engineering and Biotechnology, Bangkok. pp: 167-170. Du, H.H. ; Xu, Z.R. ; Wu, X.F. ; Li, W.F. and Dai, W., 2006. Increased resistance to white spot syndrome virus in Procambarus clarkii by injection of envelope protein VP28 expressed using recombinant baculovirus. Aquaculture. Durand, S.; Lightner, D.V. ; Nunan, L.M. ; Redman, R.M. ; Mari, J.and Bonami, J.R., 1996. Application of gene probes as diagnostic tools for white spot baculovirus (WSBV) of penaeid shrimp. Diseases of Aquatic Organisms. Vol. 27, pp: 59-66. Flegel, T.W. and Alday-Sanz, V., 1998. The crisis in Asian shrimp aquaculture: current status and future needs. Journal of Applied Ichthyology. Vol. 14, pp: 269-273. Houshmand, H., 2014. Protection of white leg shrimp (Litopenaeus vannamei) against white spot disease virus using oral recombinant bio encapsulated VP28 protein, a thesis Submitted in partial fulfillment of the requirement for the degree PhD in Aquatic Animals Health, Shahid Chamran University, Ahvaz, Iran., No: 9358959 (in Persian). Inouye, K.; Miwa, S.; Oseko, N.; Nakano, H.; Kimura, T. and Momoyama, K., 1994. Mass mortalities of cultured kuruma shrimp, Penaeus japonicus, in Japan in 1993: electron microscopic evidence of the causative virus. Fish Pathology. Vol. 29, pp: 149-158. Jha, R.K.; Xu, Z.R. and Pandey, A., 2006. Protection of Procambarus clarkia against white spot syndrome virus using recombinant subunit injection vaccine expressed in Pichapastoris. Fisheries Science. Vol. 72, pp: 1011-1019. Jha, R.K.; Xu, Z.R. ; Bai, S.J. ; Sun, J.Y. ; Li, W.F. and Shen, J., 2007. Protection of Procambarus clarkii against white spot syndrome virus using recombinant oral vaccine expressed in Pichiapastoris. Fish and Shellfish Immunology. Vol. 224, pp: 295-307. Kou, G.H. ; Peng, S.E. ; Chiu, Y.L. and Lo, C.F., 1998. Tissue distribution of white spot syndrome virus (WSSV) in shrimp and crabs. In: Advances in Shrimp Biotechnology (ed. by T.W. Flegel), pp: 267-271. National Center for Genetic Engineering and Biotechnology, Bangkok. Lightner, D.V., 1996. A Handbook of Pathology and Diagnostic Procedures for Diseases of Penaeid Shrimp. World Aquaculture Society, Baton Rouge, Louisiana, USA. Lightner, D.V., 2003. Exclusion of specific pathogens for disease prevention in a penaeid shrimp biosecurity program. In: Biosecurity in aquaculture production systems: Exclusion of pathogens and other undesirables (C.S. Lee & P.J. O’Bryen, eds.). The World Aquaculture Society, Baton Rouge, LA, USA. pp: 81-116. Loker, E.S. ; Adema, C.M. ; Zhang, S.M. and Kepler, T.B., 2004. Invertebrate immune systems not homogeneous, not simple, not well understood. Immunology Review. Vol. 198, pp: :10-24. Mavichak, R.; Kondo, H.; Hirono, I.; Aoki, T.; Kiyono, H. and Yuki, Y., 2009. Protection of pacific white shrimp, Litopenaeus vannamei against white spot virus following administration of N-terminus truncated recombinant VP28 protein expressed in Gram-positive bacteria, Brevibacillus choshinensis., Aquaculture Science. Vol. 57, pp: 83-90. Musthaq, S.S.; Sudhakaran, R.; Ahmed, V.P.I. ; Balasubramanian, G. and SahulHameed, A.S., 2006. Variability in the tandem repetitive DNA sequences of white spot syndrome virus (WSSV) genome and suitability of VP28 gene to detect different isolates of WSSV from India. Aquaculture. Vol. 256, pp: 34-41. OIE (World Organization for Animal Health, formerly Office International des Epizooties). 2003. Manual of diagnostic tests for aquatic animals, 4th ed. OIE, Paris. Rojtinnakorn, J.; Hirono, I.; Itami, T.; Takahashi, Y. and Aoki, T., 2002. Gene expression in haemocytes of kuruma prawn, Penaeus japonicus, in response to infection with WSSV by EST approach. Fish and Shellfish Immunology. Vol. 13, pp: 69-83. Rout, N.; Kumar, S.; Jaganmohan, S. and Murugan, V., 2007. DNA vaccines encoding viral envelope proteins confer protective immunity against WSSV in black tiger shrimp. Vaccine. Vol. 25, pp: 2778-2786. Roux, M.M. ; Pain, A.; Klimpel, K.R. and Dhar, A.K., 2002. The lipopolysaccharide and β-1, 3 glucan binding protein gene is up regulated in white spot virus infected shrimp (Penaeus stylirostris). Journal of Virology. Vol. 76, pp: 7140-7149. W.P.W., 2002. Preliminary study on the haemocyte response to white spot syndrome virus infection in black tiger shrimp Penaeus monodon. Diseases of Aquatic Organisms. Vol. 51, pp: 149-155. Vaseeharan, B.; Anand, T.P. ; Murugan, T. and Chen, J.C., 2006. Shrimp vaccination trials with the VP292 protein of white spot syndrome virus. Letters of Applied Microbiology. Vol. 43, pp: 137-142. Walker, P.J. and Mohan, C.V., 2009. Viral disease emergence in shrimp aquaculture: origins, impact and the effectiveness of health management strategies. Review in Aquaculture. Vol. 1, pp: 125-154. Wang, C.H. ; Lo, C.F. ; Leu, J.H. ; Chou, C.M. ; Yeh, P.Y. ; Chou, H.Y. ; Tung, M.C. ; Chang, C.F. ; Su, M.S. and Kou, G.H., 1995. Puriﬁcation and genomic analysis of baculovirus associated with white spot syndrome (WSBV) of Penaeus monodon. Diseases of Aquatic Organisms. Vol. 23, pp: 239-242. Witteveldt, J.; Cifuentes, C.C. ; Vlak, J.M. and Van Hulten, M.C., 2004a. Protection of Penaeusmonodon against white spot syndrome virus by oral vaccination. Journal of Virology. Vol. 78, pp: 2057-2061. Witteveldt, J.; Vlak, J.M. and Van Hulten, M.C., 2004b. Protection of Penaeus monodon against white spot syndrome virus using a WSSV subunit vaccine. Fish and Shellfish Immunology. Vol. 16, pp: 571-579. Witteveldt, J.; Vlak, J.M. and Van Hulten, M.C., 2006. Increased tolerance of Litopenaeus vannamei to white spot syndrome virus (WSSV) infection after oral application of the viral envelope protein VP28. Diseases of Aquatic Organisms. Vol. 70, pp: 167-170. Wu, W.; Wang, L. and Zhang, X., 2005. Identiﬁcation of white spot syndrome virus (WSSV) envelope proteins involved in shrimp infection. Virology. Vol. 332, pp: 578-583. Wu, J.L. ; Nishioka, T.; Mori, K.; Nishizawa, T. and Muroga, K., 2002. A timecourse study on the resistance of Penaeus japonicus induced by artificial infection with white spot syndrome virus. Fish & Shellfish Immunology. Vol. 13, pp: 391-403. Yi, G.; Wang, Z.; Qi, Y.; Yao, L.; Qian, J. and Hu, L., 2004. VP28 of shrimp white spot syndrome virus is involved in the attachment and penetration into shrimp cells. Journal of Biochemistry and Molecular Biology. Vol. 37, pp: 726-734. Yi, M.; Jiang Feng, L.; Zhang, X.W. ; Wang, X.W. ; Zhao, X.F. and Wang, J.X., 2012. A vector that expresses VP28 of WSSV can protect red swamp crayfish from white spot disease. Developmental and Comparative Immunology. Vol. 36, pp: 442-449. Zhu, Y.; Ding, Q. and Yang, F., 2007. Characterization of a homologous-region-binding protein from white spot syndrome virus by phage display. Virus Research. Vol. 125, pp: 145-152.